Where the Mountain Meets the Moon is simply beautiful  not just for the artwork, but for the storytelling and the message contained within. Grace Lin grew up on stories, loving the books and illustrations that were classics in the United States. Seeing her love of stories, her mother brought in Chinese fairy tale books, allowing Grace to learn a little of her cultural heritage. These early experiences inspired the perfect mixture of the themes of both Asian fairytales and North American classics in Where the Mountain Meets the Moon. But did I mention it was gorgeous? I’ve been in love with the cover since I first saw the sketches at Blue Rose Girls, and color illustrations are featured throughout the book. What can you share about the artwork, especially that brilliant cover? In late 2003, I did a cover illustration for Cricket magazine of an Asian girl riding a flying red dragon. As I painted the image, the girl captivated me. I had painted her in traditional clothing, over an idealized Asian landscape. I imagined her full of delight on her ride in the sky, full of adventure and life... That image I painted for Cricket was to transform into my website logo and then into the cover of Where the Mountain Meets the Moon. In China, we visited a cloisonné factory (a tourist standard!) and I I found the many steps that the artists do to create cloisonné images fascinating. The intricate patterns, the ornate borders had a certain jewel-type richness that I felt fit the magical atmosphere I wanted to achieve in Where the Mountain Meets the Moon. So the cover illustration was very much inspired by that. The full-page illustrations also had cloisonné as their muse, but they were also mixed with influences of traditional Chinese paintings and the art of antique Chinese vases and ceramics. How did you incorporate your own personal experiences into Where the Mountain Meets the Moon? When I first began writing this book, I had visited Hong Kong and Taiwan, which were wonderful trips. Being Asian-American (and more American than Asian), it was a fascinating experience to be surrounded by a culture that was so foreign and familiar at the same time. Whenever I viewed the landscape, saw a temple or a sampan in the water, I suddenly would remember the Chinese folktales I had read as a child. I could see them happening in the setting around me and I knew in there was a book waiting to be written. 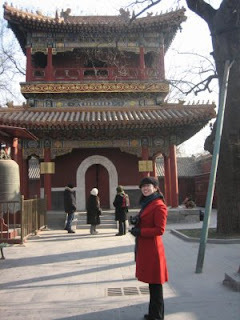 I was almost three-quarters finished with writing the book when I went to visit China. This was the perfect time to go, as I had an idea of what kinds of things I wanted to see and research there, but the book was still open enough to be changed. And it was wonderful! Actually seeing China with my own eyes and experiencing it added such a rich layer to the story. For example, one of the excursions we took especially for the book was a visit to a tiny mountain village. I wanted to see a mountain village because I knew Minli (the main character in Where the Mountain Meets the Moon) would be visiting one. The whole time we were there, we were freezing cold but the villagers were so friendly and red-cheeked (which I was to find out later was wind-burn, not good circulation). So, those elements of mountain cold and a warm, friendly shelter became the backdrop of the village Minli visits. Well, this book has a lot of personal meaning for me. I prefer not to go into it too much, but as much as it is an homage to the folk and fairytales of my childhood, it is really to honor my late husband. I began the book when he was ill and asked me to write a fantasy to help him imagine himself elsewhere. I finished the book after his death, and it helped me realize the important things in life. My next book will be Ling and Ting. It is an early reader (which is a format I have been wanted to try for a while) about Chinese-American twins. It is almost the reverse theme of The Year of the Dog, using twins, I am trying to show how even when people look the same they can be different. After that I have a picture book on the Moon Festival and a picture book set in Beijing. In the meantime, I have started preliminary drafts for a novel that may become Summer of the Pig, to take place in between my past novels The Year of the Dog and The Year of the Rat. I have no plans on writing a sequel to Where the Mountain Meets the Moon, but I would like to write another fantasy novel someday. When is the book coming out, and where can we find the book release information and the celebration? The online book launch is July 1st at my Facebook page and the book website. So far Grace has been to Bildungsroman, Shelf Elf, and Paper Tigers, where she has shared other perspectives on her writing and where you’ll see additional pages from the book. Tomorrow she’ll be visiting Charlotte’s Library and then will continue on her blog tour journey for the rest of the week. Thanks so much for hosting me and this lovely interview! I'm SO glad you liked the book. Thank you for hosting Grace Lin, MotherReader. This was a great piece to learn more about the book which has a cover the electrifies my interest!